Are you looking for a fun, educational, and downright delicious outing with your family? Then come on out to Hill Creek Farms in Mullica Hill, NJ in picturesque South Harrison Township. Our idyllic 24-acre local produce farm has two huge apple orchards with over 17,000 apple trees between them, plus an orchard of plums, Asian pears, and nectarines. We offer guests a chance to experience a real working farm through a unique agritourism (or, agricultural tourism) outing. It’s the perfect weekend activity for family fun! Guests are invited to take advantage of our u-pick orchards, stroll through our pumpkin patch, enjoy our tented picnic area, and capture precious memories at our family photo area. Kids will love our many attractions, where they can dig for buried treasure at the Gem Mining Co., engage in a rubber duck race, or ride the Barrel Train Express to the cornstalks. And our spacious playground offers plenty of free activities all day long. After working up an appetite, head over to the Loft Café for soup and sandwiches, or to our on-site bakery for our scrumptious apple cider donuts, apple pies, and cakes, all made from scratch. Speaking of apple cider, be sure to pick up a jug or two from The Fresh Farm Market, while also shopping local organic produce, local wine, and delightful ready-to-eat meals. And during the colder months, be sure to warm up by our open firepit. Our biggest draw is our farm-to-table meal events (coming soon), overseen and led by Chef Jen Muldoon. We will whip you up a meal unlike any other, while you enjoy a glass of our very own Hill Creek Apple Wine from Auburn Winery. As you dine, take in live music. 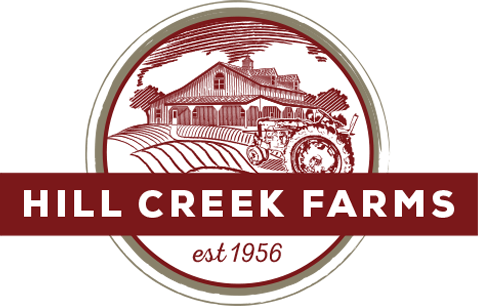 For an enjoyable family outing that will prove unforgettable, be sure to visit us at Hill Creek Farms.